A generation back, the average izakaya tavern was noisy, cheap, smoky and the clientele overwhelmingly male. There would usually be one brand of beer; two choices of sake, warmed or room temperature; and food that ranged from reliable to rough and ready. Things have changed. 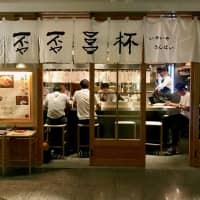 The intervening years have seen the old-school izakaya go the way of the suit-clad salaryman: They still exist in Tokyo but they’re far less visible. 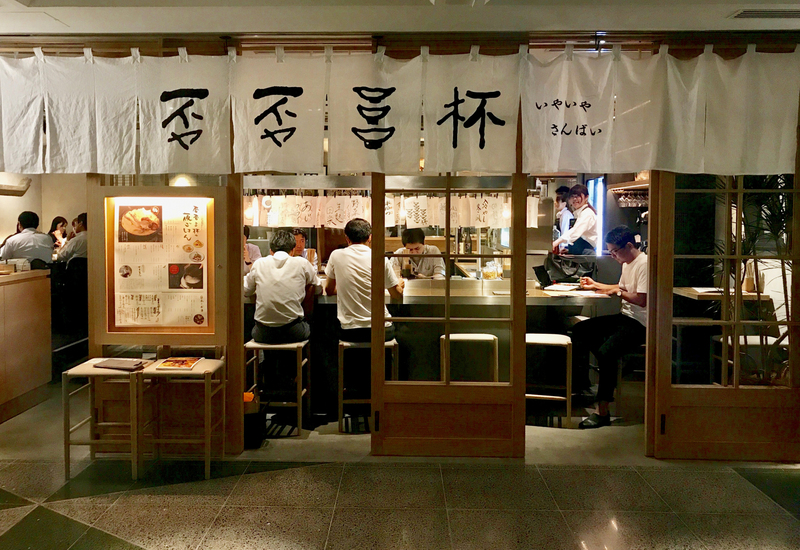 Instead, a more refined type of izakaya has emerged, with premium sake, quality food to pair with it and substantially more nonsmoking locations. Iyaiya Sanbai takes the idea a step further away from those roots. It’s still without question a place where drinking and eating share equal importance, where you can settle in for conversation or just while away the hours until you’re satiated or the last train calls. But in both look and feel, it reflects a contemporary approach to the time-honored pleasures of the izakaya. Slotted into a basement-level corridor lined with eateries in the newly opened Aoyama Building, Iyaiya Sanbai is brightly lit, quiet, calm and absolutely smoke-free. The interior is a mix of modern and traditional. And, with the sliding doors pulled open across the front, it feels welcoming, whether you’re there for the whole evening or just dropping in solo for a few nibbles. Iyaiya Sanbai’s curious name derives from a drinker’s phrase from the old days, and the well-curated beverage list offers sake, shōchū, wine and spirits, all of Japanese origin. But to understand the true priorities here, look away from the bar and into the open kitchen, where a large, metal, Kyoto-style rice cauldron takes pride of place. The message is clear: You will eat well. Even the simplest sake snacks are prepared in-house. Start with some soy-simmered eggplant, sardines lightly seasoned with tart umeboshi (pickled plum), or the potato salad accented with finely chopped iburigakko pickles and topped with a whole smoked soft-boiled egg. Don’t miss the jikasei sukui-dōfu, warm, smooth, comforting curds of freshly made tofu the likes of which you will rarely taste elsewhere. And, if you’re sitting at the counter, you can watch the chefs whipping up batches of tasty dashimaki omelet. More substantial offerings include miso-grilled salmon, spicy chicken wings and wagyu sukiyaki or beef katsu cutlets. Close the meal with rice that is specially cooked to order and brought to your table in miniature versions of the rice cooker you see in the kitchen. At lunch, the menu is pared down to half a dozen set meals, all based around rice, hearty miso soup and side dishes. This emphasis on simplicity and quality reflects the roots of executive chef Atsushi Nakahigashi. Kyoto-born and trained but now based in New York, he brings a youthful, contemporary, well-traveled perspective to the menu. It is a perfect fit with the overall approach at Iyaiya Sanbai, and points the way ahead for the new izakaya generation.